Did you know that even if you purchase an airline ticket, and hold confirmation of the purchased flight, the airline can still deny you boarding simply because the airline over-booked the flight? Well, it’s true. You can be bumped to a later flight without knowing until you try to check-in at the airport. 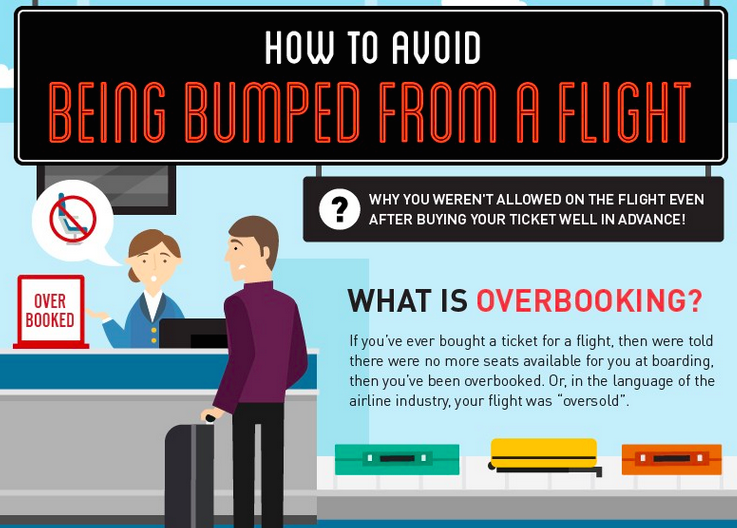 Read below to find out more about how to avoid getting bumped from your flight, and what to do if your flight is over-booked. Most airlines over-book their flights and accept bookings for more seats than are available in order to minimize their impact on the percentage of passengers who either don’t show up for the flight or who cancel their booking at the last-minute. Unfortunately, this business practice can sometimes backfire and inconvenience passengers if more individuals than expected show up for the flight. Industry practice is that the airline must first make a request for volunteers willing to take a later flight before a passenger can be denied boarding when an over-booking situation arises. If there are no volunteers, this will result in a passenger being involuntarily denied boarding or bumped from a flight. Normally, the airline’s customer service agents will help their passengers find a seat on the next available flight at no additional cost. However, depending on the individual’s circumstances, this doesn’t always remedy the problem, especially if the next available flight is several hours later or departing the next day. Tip #1. Use the online check-in process before the flight. Some airlines will send you an email prompting you to check-in online 24 hours before the flight. Tip #2. Pre-select your seats when you check-in online. Completing the advance online check-in process, including selecting your seat, will save time at the airport and assist in securing your seat on the flight. Tip #3. Follow the airline’s check-in times. Always arrive at the airport well in advance of departure to complete the check-in process. Each airline has deadlines for check-in times, baggage drop-off as well as the deadline to be present at the boarding gate. The times vary depending on whether you are travelling domestic, trans-border or international. These deadlines may appear to be unreasonable; however, they are in place to ensure travelers have allowed themselves sufficient time to board their flight. If you have attempted to resolve your complaint with the airline and remain dissatisfied with the outcome, you may wish to turn to the Canadian Transportation Agency (CTA) whose mandate includes assisting consumers through its Air Travel Complaints Process. The CTA will evaluate your circumstances against the airline’s legal obligations. Ultimately, the airline’s tariff which sets out the airline’s terms and conditions of carriage including the fare rules is the contract between you and the airline. It covers your rights and obligations as an airline passenger as well as your airline’s rights and responsibilities to you. More information about the CTA’s Air Travel Complaints process including the types of air travel issues it can assist consumers with and access to their complaint wizard may be found at www.otc-cta.gc.ca Being more informed about air travel and following the travel tips provided should help avoid the possibility of being bumped from a flight when making your next journey.